One of the dorkiest most amazing gaming systems to appear in years has just been unvai led (for now via eBay only): The Gamerator. A full-scale arcade-style gaming system, The Gamerator is loaded with 187 classic games… AND a refrigerated interior that can hold a pony-keg of beer. 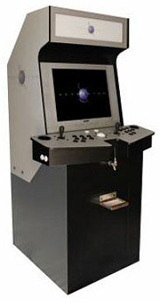 The system includes realistic joysticks, buttons, and trackball – all reminiscent of the arcade systems of yester year. But, unlike your daddy’s arcade games, The Gamerator also boasts a 24-inch LCD screen and two cup holders. Plus, when you tire of Asteroids (not that that would happen any time soon), you can hook the machine up to almost any PC or game system with an adaptor (sold separately). Currently being sold on eBay, the minimum bid for The Gamerator is $2,000 and the auction will run until November 10.